A while ago I posted a link to a Creepypasta story I wrote. Here it is again if you never read it. If you like H.P. Lovecraft, this is for you. I will tell this story only once. Pass it around. Alter it if you like. But once I am done with the story. I want nothing more to do with it. Reliving the experience is bad enough, and I will not do it twice. Not long after my tenth birthday, my parents shipped me off to Schroon Lake in upstate New York where my auntie and uncle lived with their son Harry. My parents said it would be a good chance to reconnect. I hadn’t seen any of them since I was four. As a child, I accepted the reasoning. In hindsight, I think my parents wanted a romantic week to themselves. Also, Harry was an antisocial boy in desperate need of friends like me. Although their house was small, the dense forest stretched for miles in every direction. What a lonely life, I remember thinking. Not a single neighbor in sight. Only tall oaks and bristled pines as far as the eye could see. My parents said their hellos to my aunt and uncle, and then said their goodbyes to me. Harry was nowhere to be seen. After showing me to the room I would share with Harry, auntie left to cook dinner. While I set my stuff down on the bottom bunk of the bunkbed, Uncle stuck around to make small talk. He asked me if I was sad that summer vacation was nearly over. Like any sane child, I said I was. He asked me about my grades, and then with a great smile told me how Harry was the brightest student in his class. Of course, Harry’s class numbered just forty people whereas mine hovered around four-hundred people. But what did I know about Harry? The last time I saw him, I was a toddler and Harry was in diapers. I couldn’t even tell you what he looked like. “Where is Harry?” I asked. My uncle’s smile faltered. “Oh, he’s out playing,” he said. “Harry spends all day in the forest. So long as he comes home for dinner, we can’t complain.” But I could tell by the drop in his tone, he wished Harry spent his time hanging out with friends like any normal kid his age. As I learned, Harry came home like clockwork, always just in time for dinner. Just as auntie took the pot roast out of the oven, the back door creaked open and Harry shuffled in. He was a short, skinny kid with long, floppy hair and purple rings under his eyes. He glanced at me, but said nothing. It was clear I didn’t interest him in the slightest. “Mom, I’m not supposed to—” She flashed a harsh look. Harry shoved a piece of pot roast in his mouth before muttering, “Fine.” He said nothing more for the entire dinner. Auntie and uncle asked me what I did earlier in the summer, what I wanted to be when I grew up, and so on. I told them I went to the Jersey shore and that I wanted to be a zookeeper. To be polite, I asked Harry about himself. But uncle answered for him, as if he wasn’t there. “Harry went to art camp,” he said. “He wants to be an artist. When he’s not exploring the forest, he’s doodling in his sketchbook.” Harry didn’t look up from his food. When we finished eating, Harry fetched his sketchbook and sat down on the couch. Auntie passed out slices of apple pie, still warm from the oven. Until the end of the night, we chowed down and watched TV. Except for his drawing hand, Harry kept still and silent like another piece of furniture. I tried to peek at what he was drawing, but he angled the sketchbook away from me whenever I came close. “What are you drawing?” I asked. He didn’t answer. I decided to look at the drawings later that night when Harry showered before bed. But he took the sketchbook into the bathroom with him. Finally, when he lay down to sleep, I thought Harry might separate from the book. But he tucked the book under his pillow and fell asleep. So I gave up and went to bed myself. The bed was so stiff I would’ve felt better sleeping on the floor. Regardless, it wasn’t the bed that kept me awake. It was Harry’s feverish mumblings. I haven’t the slightest idea what he was saying. “To som mo khai to malo mo ena makhar so.” It sounded like utter nonsense to me, a completely different language, harsh and guttural. Of course I didn’t think anything of it. I just wanted to sleep. The next day, Harry took me into the forest. The trees loomed high over us, and the thick canopy of leaves drowned the woods in twilight. Dirt trails wove through the area like veins on a giant, earthen body. But they were not smooth, clean-cut trails. They were rough, bumpy paths carved out of the forest from frequent use. “Where are we going?” I asked Harry. Harry took me along one of the many paths. I could tell he hadn’t taken this path in a while. Grass had started to creep up across the path’s edges, and the only footprints were those of the small woodland creatures. Sunlight streamed down on us in brilliant gold rays as the tree cover broke. Schroon Lake expanded before us, its surface as sleek and shiny as a mirror’s edge. I immediately took off my shirt and jumped into the cool, calm water. Harry stood on the sandy shore. “Wait here,” he said. “I’ll be back.” Before I could ask where he was going or when he’d be back, Harry had disappeared into the forest. Since I didn’t know the way back home, I had to wait. I swam until my limbs shivered from the cold water. Then I lay out in the hot sun until sweat dripped down my forehead. Then I waded out into the lake and stared at the line of trees bordering the water. Half an hour had passed, and still Harry hadn’t returned. Sighing, I hit the water and cursed my parents for sending me to my weirdo family in the first place. From miles off, a low rumble broke through the trees. The tall oaks bent and shuddered and shed their leaves. Birds crowed and shot into the sky in great flocks. As the sound rolled across the lake, it resonated in my bones, and suddenly I became gripped by fear. “Harry,” I called. “Harry.” But he did not answer. I fled the lake and redressed. For another half an hour, I paced back and forth, waiting either for Harry or for whatever made that massive roar. Although I could not say how I knew, I was certain something ancient had made that noise, something beyond the history or understanding of man. “Harry, did you hear that?” I said. “I was with my friends,” he said. We returned home along one of the many paths. “But what was that noise?” He wouldn’t answer. I asked him many more questions, but he wouldn’t answer any of them. When we reached the door to his house, Harry stopped. “Don’t say anything to my parents,” he said. It seemed outrageous to ignore what I’d heard, but Harry’s parents wouldn’t believe me if I told them. Worse, perhaps they already knew and didn’t want to talk about it. That evening, we ate dinner, watched more TV, and finished off auntie’s pie. Harry spent the night scribbling in his sketchbook. As always, he guarded the contents of the book closely, even when he slept. And again Harry interrupted my sleep with his nonsensical muttering. “Ston upno khai sto khupnema, emai o Makhar so.” It was connected to the noise I had heard. I knew it. Regardless, I couldn’t make sense of any it and soon fell asleep from exhaustion. The next day followed the same pattern as the day before. Harry guided me through the forest. Then he left me behind at the lake. Half an hour later, a loud bellow shot through the woods. Half an hour after that, Harry returned to guide me home just in time for dinner. It was an unspoken schedule we followed religiously. However, on the fourth night, Harry left his sketchbook on top of his bed. I was a guest in his home, so I knew I should’ve allowed him his privacy. But naturally, I couldn’t contain my curiosity. As soon as I heard the shower turn on, I opened the sketchbook. The first few pages depicted animals picked apart and tortured: limbs impaled, skin flayed, muscles bare, bones cracked. The body parts were rendered with vivid details someone could only imagine if they had seen it themselves. I flipped through the pages as quick as I could. Before long, I realized I was no longer looking at the bodies of squirrels, rabbits, and deer. The tortured bodies were those of men and women stripped bare of more than just clothing. My heart skipped as the shower shut off. I turned one last page. Unlike the other drawings, this one portrayed a group of men and women in a ring around a fire. The fire burned high, but not high enough to hide the figure behind it. On the far side of the fire, an immense creature, tall as the trees, hunched over its bony body. It leaned on its arms which were twice as big as its torso. Long strands of hair hung over its head. Because of the hair, I could not see the creature’s eyes, but I could see a pair of lips that stretched across the entirety of its face. Despite its hideous appearance, no one in the ring looked at the creature. Instead, they bowed their heads in reverence. I stared at the picture as long as I could, but time was limited. I closed the book and settled into my bed just in time for Harry to return. Falling asleep was extra hard that night. A normal child might have told Harry’s parents or called his own parents to get him the hell out of there. But I couldn’t do it. Not yet. I needed to see what was in the woods. The next day, I followed the unspoken schedule. By now I had memorized the path to and from the lake, but Harry guided me there out of habit. As soon as my feet touched the sand, he stopped to speak. “Let me guess,” I said, “Wait here?” For the first time, a smile appeared on his lips. He hesitated for a moment, and then entered the forest without a word. He knew I’d wait there for him as always. But instead I followed Harry just far enough to see him without being seen myself. We trekked through the woods for ten minutes. Our path was fairly linear, but many other paths branched off from ours, perhaps leading to other homes. I stepped lightly and avoided sticks and leaves when I could. Not once did Harry suspect I was following him. Then, after ten minutes, the trail veered right and Harry disappeared from sight. As I neared the sudden turn, I could see the trail exited onto a wide glade. 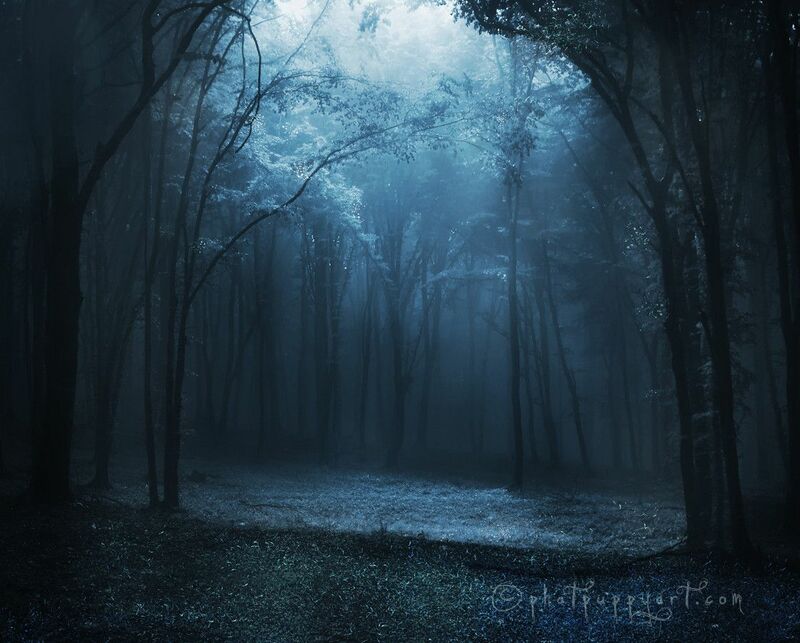 Inside the clearing, a fire crackled and voices chanted in the guttural language Harry muttered in his sleep. Aside from the chanting, I heard a woman cry. “What are you doing?” she asked through sobs. “Let me go! Let me go! Please!” I approached the glade as close as I dared. Through breaks in the trees, I saw a ring of men and women in front of a bonfire. Harry had joined the end of the ring and was chanting along with the others. Across from him, a naked woman stood chained to a post. She continued to cry and beg. Then, among the choir of voices rose another voice, loud enough and deep enough to drown out the others. Heavy footsteps shook the earth like a rhythmic thud commanding the beat of the chanting. I heard the crack of wood splitting and then the chanting stopped. The woman’s screams roared through the forest. She could no longer form words, only screams and short, choking sobs. From between the trees, I spied the pale, bony leg of a gargantuan creature. My eyes widened as I followed the leg to the rest of its naked, hairless body. Just as in the picture, the creature leaned on its arms, which were as long and thick as tree trunks. Over its chest, the white skin stretched so taut I thought it might burst. Yet, despite all its horror, I could not resist the urge to see more. Most of all, I wanted to see its face. I craned my neck for a better look, but the canopy of leaves blocked my view. I could see only to the creature’s chin, some fifteen feet up. I looked back down at the chanting group members. Knives had appeared in their hands, including Harry’s. One by one, they sliced off a piece of the woman. As the woman’s screams soared, the creature behind the fire purred with delight. “Jesus christ,” I said to myself. I screwed my eyes shut and tried desperately to shake myself from the nightmare. “Just a dream. Just a dream. Just a dream,” I said. When I opened my eyes, the woman’s cries had stopped. Her head drooped down at her chest. She still appeared alive, but she had lost too much blood. By now, she could only shake her head from side to side. But before I did, the creature bent low to catch me in its eyes. As its face neared the fire, light shone across its ashen face, and I saw that the creature did not indeed have eyes. Where eyes should have been, there was only smoothed over skin. The creature’s lips parted into a razor-toothed smile that spanned from ear to ear. Then the creature spoke to me. Its thick, guttural words penetrated my mind as much as it did my ears. Although I didn’t know the ancient language it spoke, somehow I understood the creature perfectly. “Emai o Makhar o mikhras, dikhons ton nekhtorn, khomis to aino. Na me latveis.” That is, “I am Makhar the Small, Deacon of the Dead, Earl of the Eternal. Worship me.” When I did not move or answer, Makhar cocked his head so far to the side, I thought he might snap his neck. Thin, black strands of hair dangled around the harsh curve of its face. Then the creature opened its mouth and bellowed into the trees. The great roar shook the forest and nearly knocked me over. Harry covered his ears from the terrible noise and continued to mouth the word “run.” He didn’t need to tell me again. I darted along the many forest paths. Footsteps plodded behind me, but I would not look. Screams and shouts called after me, but I would not look. Highest among the shouts was Harry’s. “Wait!” he yelled. “Wait!” But he was not talking to me. He was talking to the others. Without stop, I sprinted to the beach and then to Harry’s home. All the while, I prayed the crazed cult would not appear from a side path. Surely there was a quicker way to get from the glade to Harry’s house. Anyone of them could have found that path. Somewhere along the way, I lost Harry and the others. Still, it didn’t stop me from running as fast as I could. And when I made it home, I burst through the back door. Tears streamed down my face as I told them what I saw. They thought it was a joke or a game. But when I didn’t back down from the tale, they agreed I must be sick. Auntie felt my forehead and decided I had a fever. She called my parents, apologized for disturbing their week alone, and asked them to pick me up. They would be there in an hour. “So what happened to Harry?” uncle asked. I didn’t know. We sat down for dinner. Any second, we thought, Harry would come through the door. But he never did. We finished dinner. Not long after, my parents arrived. Harry still hadn’t come home. My parents agreed to help auntie and uncle look for Harry, but I gripped their legs and told them not to go in the forest. I was in hysterics. Finally, my parents rushed me home. As it turned out, I did have a fever, and quite a strong one. My parents forced me to take an ice bath and a Motrin, and then go to sleep with a damp washcloth over my head. Regardless, the fever lasted well into tomorrow. And in the morning, my parents said I had spent the whole night muttering gibberish in my sleep. As for Harry, the police were called. I gave them my story. I told them just how to reach the glade. They found the glade, but there was nothing there, not even the remains of a fire. To this day, Harry is still missing. My parents sent me to therapy in the hopes I would lose the crazy story and tell the truth. It didn’t work. So we don’t talk about that week anymore. We’ve all tried to forget about it. In fact, this is the first time I’ve talked about it in years. Was Dragon Ball Super Really Super?